Junior goalkeeper Marjory Coates. Media from athletics.greenville.edu. 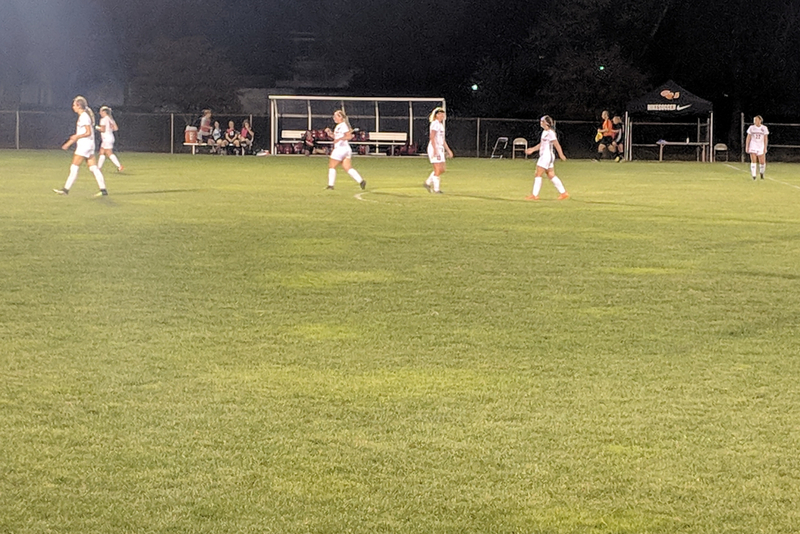 As the Greenville University Women’s Soccer Team is in the midst of their conference games, much of their success has come from the great defensive outings they’ve put together. 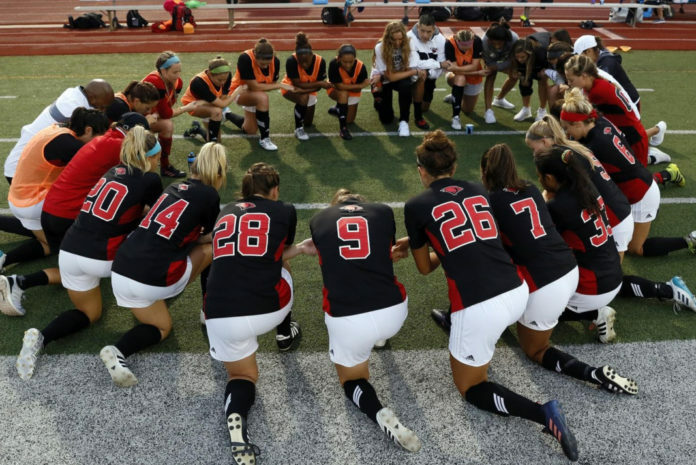 The team holds a record of 9-4 and of those nine wins, seven of them have been shutouts. Perhaps one of the biggest reasons they’ve been able to perform so well defensively is because of their highly talented goalkeeper, Marjory Coates. For those who may not know her, Coates is a junior here at GU double majoring in Biology and Chemistry. She is originally from Decatur, Illinois, where she attended Warrensburg-Latham High School. Beginning to play soccer at the local YMCA around four-years-old, Coates explained that she loved playing soccer ever since then due to the friends she’s made throughout the years. Her parents also offered a great amount of encouragement and support for her with the multiple other sports she’s played along with soccer such as volleyball, basketball, and track. The Panthers versus Blackburn College that Coates sat out to nurse a minor injury. Media by Gavin Jordan. 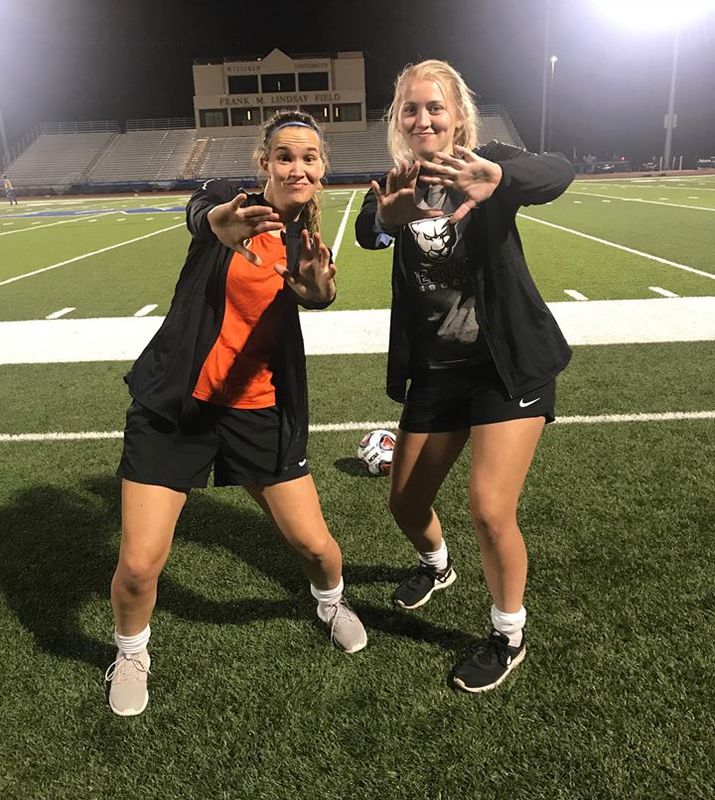 Coates (left) and freshman goalkeeper, Reaghan Lesh celebrating their first shutout. Media from facebook.com. When her time here at GU is up, Coates is hoping to go to veterinarian school and wants to use that profession as an outlet to do mission work in areas of the world that struggle to keep livestock alive and healthy. She knows that without healthy animals, many people have no other ways of providing food for themselves or their families, so she feels very passionate about her calling to help people in this way. As she has grown over the years, Coates has realized that one of the most important lessons she’s learned is that the relationships we have with the people around us are the biggest blessings we have, and she hopes to represent who God truly is through the way she interacts with everyone. 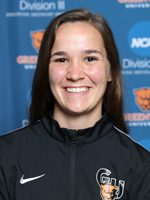 Whether it be on the soccer field, in the classroom, or within the Greenville community as a whole, Coates is always striving to make the most of whatever scenario she finds herself in. Finding someone as humble, passionate, and hard-working as she is would be a difficult task for any one of us, so it is evident that the women’s soccer team has a great leader in Coates, both on and off the field. Coates has only given up ten goals this season and has 65 saves overall, which gives her a .867 save percentage so far this season. She’s also already been named as the SLIAC Defensive Player of the Week once, so this probably won’t be the last time you hear her name. If you want to see Coates in action just come out to any of the women’s soccer games where she will be in the goal likely saving every shot that comes her way! Check out the full soccer schedule here! Hello! I’m Gavin Jordan, and I am a sports management major from Herrin, IL. I also play football here at GU!